Review On Mother Sparsh Water Baby Wipes Versus Ordinary Baby Wipes ! So As you all know that Using Baby Wipes are something very essential to keep our little ones Stay Clean, Fresh and Moisturised all day long. Most of the ordinary baby wipes available in the market are made of Harmful Polyester Fabric which can cause rashes to our baby’s delicate skin, further can causes skin diseases. The Major Component In Ordinary Baby Wipes Is Polyester (water repellent) made of plastic waste and often treated with plenty of chemicals. Baby’s skin is 10 times more delicate than adult skin which makes it prone to rashes and infections easily using such ordinary Polyester baby wipes. 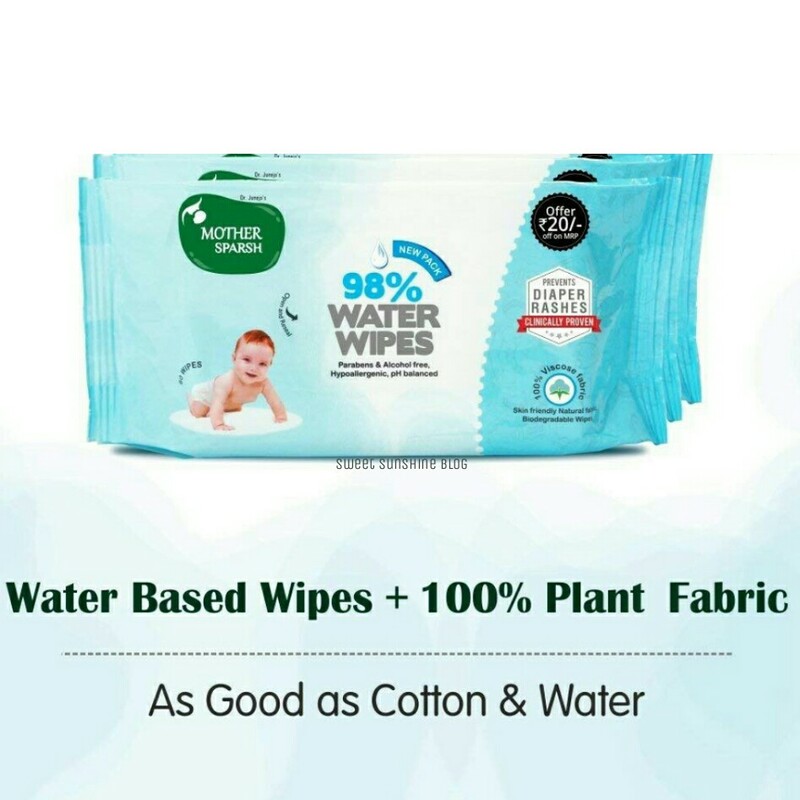 Brand Mother Sparsh, Recently Launched their new version of 98% Water Baby Wipes, purely made of 100% Viscose biodegradable fabric. 1) 98% Water Presence in these baby Wipes which are Hypoallergenic with pH Balanced pure water. 2) Natural Plant Made Fabric With 0% Polyester. 3) Planet Safe : These Baby Wipes are Natural, made of 100% Biodegradable (100% Viscose) are kind to Our Environment & Gentle To Baby’s skin. 4) Clinically Proven & tested to prevent Diaper Rashes. 5) These wipes are developed under expert’s supervision and contain quality ingredients that gently cleanse our baby’s supple, soft & delicate skin without causing irritation, uneasiness, allergy and infection. 6) Velvety Soft & Extra Smooth Fabric With No Parabens And Alcohol presence. 7) As good as pure cotton & water, made of Skin Friendly Natural Fabric. 8) Smells Very Pleasant, gives calming effect which helps in sound sleep & leaves no sticky residue after. 9) Loaded With the Goodness Of Aloe Vera & Vitamin E which further provide nourishment to their skin. 10) Price : Rs. 175/- For 80 usable sheets. Mother Sparsh Is An Indian Ayurvedic Brand. Their products are infused with Cultural Wisdom i.e Ayurveda. All Their Amazing Range Of Baby Products are enriched with goodness of Ayurvedic herbs making them Suitable to be used right from birth. So it is now proved that these wipes are the purest and safest for the baby’s delicate skin. Mommies, it’s high time say goodbye to those Harmful Ordinary baby wipes & Say Hello To These All New Mother Sparsh Best Water Based Baby Wipes. Choosing Best Products For my kids is like a big struggle for me, these days. I got easily confused by all the noise and many of options available in the market. But when it comes to Brand Mother Sparsh , it always gives me a sigh of relief. As parents, we always want our children to have the best of what we can afford. Trust Me Mother Sparsh Products are Just The Best , Safe & affordable as well. We Personally Love These Water Baby Wipes & are now an essential part of our day-to-day routine. Hope You Will Also Try Them Super Soon ? You Guys, can check the entire range of Mother Sparsh Baby Products, available across all Leading Online & Offline Stores. I Hope You All Find My Reviews & Opinions Helpful. Do Like & Share your thoughts In The comment Box Below . Let Me Hear You ! N Yes Share Share Share ,As Sharing Is Caring Forever ..
Stay Connected With “Sweet Sunshine Blog” For More Such Wonderful Updates. Baby bahut hi cute hai ?? aur uske liye to ye product bahut jaruri bhi hai ? Seems to be a great product. Afterall children should be given the best ? I love that these wipes are loaded with water making them very gentle on the skin. I know they are meant for babies but I am curious if they would work as makeup removers which are effective yet soft on the skin. When a trusted brand comes up with an organic product which is best for kids skin nothing can match that …I too used this and found really good!! I am using n loving mothersprash wipes from long.. these are indeed amazing. I have tried these New Mothersparsh wipes and totally love these. Totally worth It!! Mothersparsh wipes are must have, I am also using it for my kiddo n must say these wipes are best, it contains enough water to clean baby bums gently, it make a place in my bag these days. Baby wipes as good as these are fabulous, and I dont want to miss any chance to get these for my baby. Kids even the grown ups need these wipes and water content makes them safe. This seems like a good gentle wipe for the baby’s delicate skin. Water based wipes are really good. Mother sparsh water baby wipes are quite trending these days. This comparative study will help every mom to make wise decisions. These wipes are checking all the right boxes! We always buy what’s best for our baby, but if it is also best for environment then nothing like it. I have been using Mother Sparsh wipes from a long time and love the fact that they have a water base and are organic, devoid of any polyester. This seems like a great product. It needs to reach out to more audience and I am sure the trust of so many bloggers will help it reach it’s Destiny and soon even doctors will vouch for it. Gonna use it soon. Baby wipes those are made essentially of water and are light and safe on babies skin… That’s what every mother needs! These wipes look amazing! I am also using this wipes , they are good and better than wipes from other brands , best is 98 Percent water and chemical free . When my baby was born I didn’t know much about the difference of wipes so initially, I began with wipes having alcohol then moved to non-alcohols ones and now shifted to these water wipes.. Totally love it. Needless to say that mother Sparsh wipes are the best wipes available in the market now. It is safe and gentle on the baby’s skin. I have tried these wipes on my son’s skin and they are totally fab. I love that it has 98 percent water and are fragrance free to avoid any rashes or skin irritation. We must ensure that our kids are exposed to the most natural products. Baby wipes too must be as gentle as they could be. I totally trust Mother Sparsh when it comes to using baby wipes.